Just more problems for the crooks at Sensaslim. It never seems to end for them, does it? But it should. Soon. The sooner the better. Here is the latest media release about them from the Australian Competition and Consumer Commission. The Australian Competition and Consumer Commission has commenced proceedings against Peter Oï¿½Brien alleging contempt of court. Mr Oï¿½Brien is the sole director of Sensaslim Australia Pty Ltd, which is in liquidation. The ACCC alleges that Mr Oï¿½Brien authored or authorised communications sent on 13 August 2011 and 16 August 2011 that had a tendency to interfere with the administration of justice. 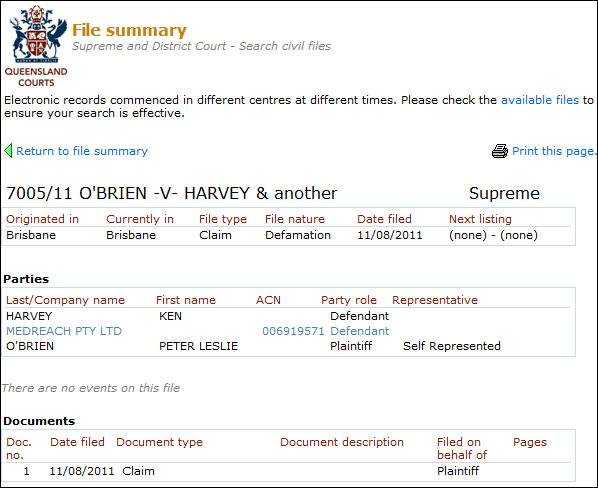 A directions hearing has been set down in the Federal Court in Sydney for 3 November 2011. 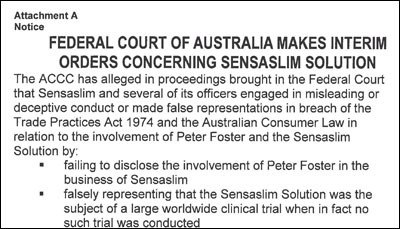 In July 2011 the ACCC instituted proceedings alleging that Sensaslim Australia Pty Ltd (in liquidation) and several individuals involved in the Sensaslim business engaged in misleading and deceptive conduct and made false representations. This action continues in the federal court. Previously, on 29 July 2011 the ACCC instituted contempt proceedings against Peter Oï¿½Brien, alleging that Mr Oï¿½Brien authored or authorised a communication sent to franchisees of Sensaslim which had a tendency to interfere with the administration of justice.